If you’re looking for a location to vacation with the kids, consider looking into real estate on St Simons Island. The scenic beauty of the area will appeal to parents, and the many activities for children make it a perfect choice. The only problem will be wishing you could stay longer. The gorgeous beaches on the island will keep children entertained for hours, but when they start looking for something else to do you won’t have to look far. Go out for a paddle in a kayak or take a bike ride on one of the paths. If you don’t have your own, you can rent some! Check out Neptune Park, which has a pool, playground, and mini-golf. Go exploring on the John Gilbert Nature Trail or climb the steps of the lighthouse to take in the view. Looking for another way to cool off? Visit nearby Summer Waves Water Park and enjoy its many water features. Sea turtles have risen in popularity among children’s favorite creatures, so take some time to visit the Georgia Sea Turtle Center. Kids can learn all about a sea turtle’s adventure from egg to adulthood, and have the opportunity to visit with many of the turtles residing at the center while they are recovering or rehabilitating. This will definitely be a highlight in an animal lover’s vacation. Don’t fret if there are a few raindrops in the forecast. While much of the island’s features are outdoors, there is plenty to do inside as well. Take a rainy day to explore many of the local shops, check out restaurants, or see a movie at the local theater. 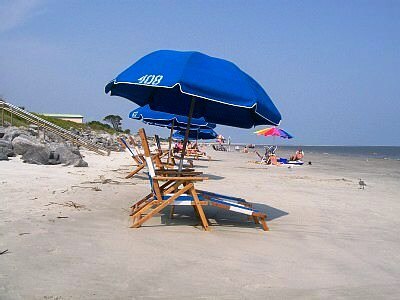 Parents and kids both agree that St Simons Island has what every family wants for vacation. Adults will love relaxing on the beach while enjoying the beautiful scenery, and there are plenty of things to keep children busy and active too. If you’re looking for a place to energize and rejuvenate with kids, contact us.